One of Japan’s most celebrated cultural treasures, “Colorful Realm: Japanese Bird-and-Flower Paintings” by Itō Jakuchū (1716-1800) is on view at the National Gallery of Art in Washington, D.C., through April 29. The 30-scroll set of bird-and-flower paintings, painted more than 250 years ago, are shown together for the first time outside of Japan, having been lent to the National Gallery of Art by the Imperial Household. The National Gallery of Art is deeply honored to present this exquisite set of 30 scrolls to visitors from around the world who will be in Washington for a very special National Cherry Blossom Festival. This is the centennial celebration of Japan’s gift to Washington, D.C., of 3,000 cherry blossom trees. I was in Washington, D.C. for Arts Advocacy Day, an event sponsored by the National Endowment for the Arts at the White House. I landed just after the space shuttle Discovery flew over the Mall. 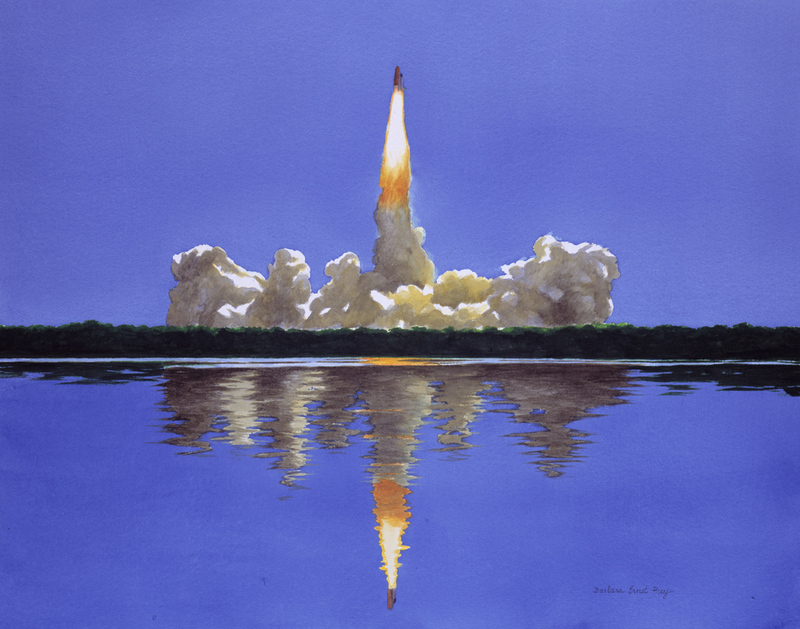 It was a poignant experience, as I had been commissioned by NASA (one of my four NASA commissions) to paint the Discovery shuttle return to flight after the Columbia tragedy, and my painting of the Discovery shuttle is also on exhibit in Washington, D.C. When I landed in D.C., I went straight to the National Gallery of Art, where I was fortunate to see this exhibit. The renderings on silk are breathtaking. There is a wonderful simplicity in the design and details. I had lived in Asia for a year, the recipient of a grant from The Henry Luce Foundation, and I spent that year painting and studying Chinese brush painting. Although these are Japanese masterpieces, there are similarities to a western novice of Chinese brush painting. I thought it would be fun to study Chinese brush painting and I thought it would be a breeze, as I was a painter. How wrong I was. I was taught classical painting and struggled with the bamboo, my flowers looked anemic. The brush is held in a very different way and holds the pigments differently than our western brushes. I quickly realized that something that looked so easy and simple to do was really a lifetime of work and study. I did continue with the painting and eventually incorporated the brushes and brushwork into my own watercolors. The exhibit is beautiful. The technical expertise and brush handling is exquisite. The flower painting — peonies with butterfly — was perhaps my favorite, maybe because I finally learned how to paint the peony and butterfly. This is the last few days of the exhibit and well worth a visit if you are in Washington, D.C.